As most of you know, I have been very conscious with my complexion lately especially passing the big 35 mark. Being disciplined, following the required daily routine at home helps quite a lot but…. to maintain and achieve a healthier glowing skin, you still need the experts. And, it would be perfect to find a renowned medi-spa with extensive clinical services. For the past years, I have tried a few laser treatments which indeed improve my skin better but the setback is the downtime, at least a minimum of 5 days for recovery which I can’t afford. I needed to get help from a reliable, affordable, and convenient one stop-shop to get my facial done, a quick fix during lunchtime. 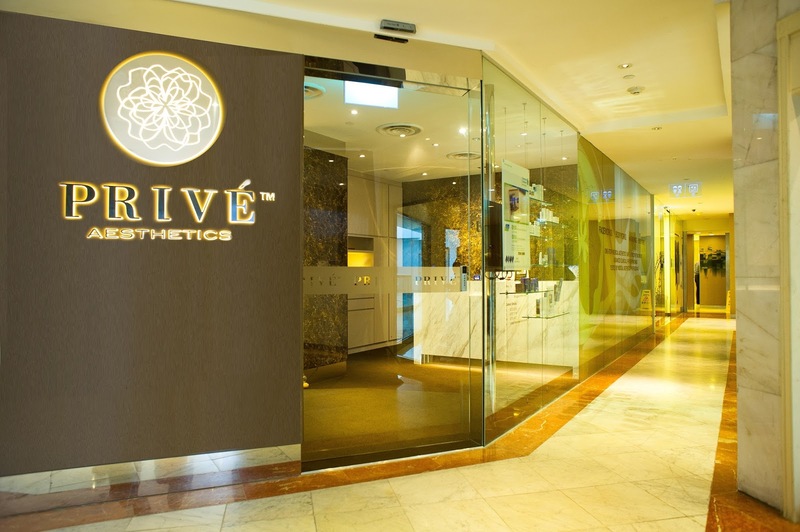 Chance upon Privé Aesthetics, located on the 3rd floor of Palais Renaissance, the heart of Orchard and the best is, away from the hustle and bustle streets. Convenient and conducive. Lastly, my favourite way to treat my skin – a mask! because it can benefit my skin in many ways after the treatment and best is, they customise the mask accordingly to my skin type. Here’s me, a comparasion right after the pampering session. My skin is noticeably brighter and healthy. I was thrilled to see my skin glowing and seriously, all you need is a lip colour and you can get back to work. While there are many similar treatments in the market now, what is most important to me is the service, location and also, the results. For friends who faces the same problem as me, go give it a try. For friends who doesn’t have such problems should try it too. Don’t you want a glowing skin? By the way, did I share that the Aqua Shine Facetherapy was awarded the best deep cleansing treatment by Her World Spa Awards 2017? The first trial is only at S$68.00! Will share about the silky back peel treatment and results which I have done in a later post! Oh did I mention? Privé is going to open a new outlet at Nex Shopping Centre, Level 2 in November!